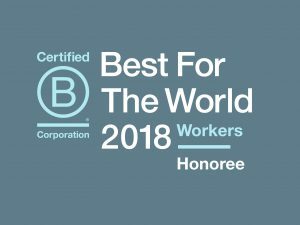 Dimensions is proud to be a B Corp since 2013 and honored to be a recipient of the Best for Workers list – 2 years in a row, which includes businesses that earned a score in the top 10 percent of more than 1,800 Certified B Corporations on the B Impact Assessment. The full assessment measures a company’s impact on its workers, community, customers and the environment. The 124 winning companies in the Workers category come from 14 industries and 15 countries. Trust. Consumer trust. Brand trust. Trust in business. Trust builds loyalty, and it matters on all levels—from consumers trusting a brand’s claims and choosing to be loyal patrons, to employees trusting their employer and working to build the company’s mission, to all of us having trust in the role of just, purposeful businesses in creating a better world. Recent research shows that B Corps—companies with a verified mission commitment and third-party review of their positive impact on people and planet—outperform in the market and show signs of continuing to do so. Brand trust pays. Just like people, companies don’t get trust; they earn it. This week, we have gathered the ways different companies and leaders are building trust with the people who buy from their businesses and the people who work with them.